Over 1,500 people marched here Sept. 30 demanding that Bush bring the troops home from Iraq. Richard Clement and his son Brian marched behind the Veterans for Peace banner. Brian Clement, 24, is an Iraq veteran who enlisted shortly after the 9/11 terrorist attacks. He served in Baghdad from 2004 to 2005. At the time he believed he was doing the right thing to make a positive difference in the lives of the Iraqi people. On Oct. 6-7, Blackgirls Anti-Violence Project and other partner organizations will host “SOS: Saving Our Selves, Saving Our Sisters,” an anti-violence initiative designed for and by African American women. “By confronting the issue of violence against women, we can begin to create a space for sisters to heal. We also hope to use the arts as a tool to stimulate dialogue and community action,” said Sharon Powell of the All Hail Project, one of the principal organizers of the event. The weekend event includes workshops, anti-violence training, counseling, performance art and films. The weekend will also bring everyone “to a common table” to discuss “how violence against Black women is connected to other violence, how we value life, and what we can do to end this crisis,” added La Vida Davis of The Asha Group, another SOS sponsor. Some 1,200 rapes were reported in Chicago last year. Even though the number is high, advocates said, they may not tell the whole story for Black women. Sometimes women simply keep silent and endure the suffering out of fear for themselves or their children, they said. For more information, call (773) 616-5058. In separate incidents, two men associated with the Sago Mine disaster have committed suicide recently. William Chisolm, a mine dispatcher, 47, shot himself on Aug. 29. John Nelson Boni, a fire boss, 63, shot himself on Sept. 30. A fire boss is required to inspect the mine before a shift begins. “I am very concerned about people at the mine. These tragic events have a long-term impact on members of the community, be they co-workers, as these men were, or just members of the greater community,” said Davitt McAteer, the governor’s special adviser on mine safety, and the lead Sago investigator. Chisolm was the dispatcher on that Jan. 2 morning when the mine exploded, killing one miner immediately and trapping 12 others. Only one of the trapped miners survived. It was the worst mining disaster in West Virginia in nearly 40 years. Five days before the explosion, Boni discovered the build-up of methane gas in the sealed part of the nonunion mine where the blast occurred. The state had requested $182,000 in federal grant money from the Substance Abuse and Mental Health Services Administration in February, but was only awarded $35,000 in April. That money has yet to get to the area’s Appalachian Community Mental Health Center. Cheers went up from commuters sitting in traffic Oct. 2 when the news came over the radio that a 700-pound young bull elk had eluded an hourlong chase by police and game commission authorities. The chase began around 8 a.m. and police cars rolled. The elk zigged and zagged through traffic, motorists stopping to let him pass. 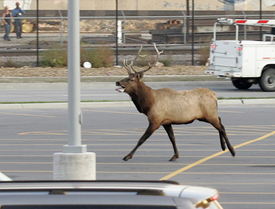 Police had him cornered once in an open downtown area, but the sly elk avoided arrest. Authorities conducted an extensive search and believe the elk crossed the city line, returning to the wild.